I've been working on an ASP.NET site for a few months that requires Windows Authentication, and it was working fine when running the site in the ASP.NET Development Server and accessing in Firefox. Today, it decided to start kicking back Forbidden messages every time I tried to access it. Why would it start doing that to me? It turns out I had at some point told Firefox to remember the password for the site, then had to change my domain credentials after doing so. Since my saved password didn't match the new password, the site was forced to return a Forbidden. I would hope that Firefox would prompt me for a new password when the authentication failed, but it didn't. So how do we get back to good in Firefox? You have to go into the Saved Passwords settings in Firefox and remove the site from the list of passwords to store. 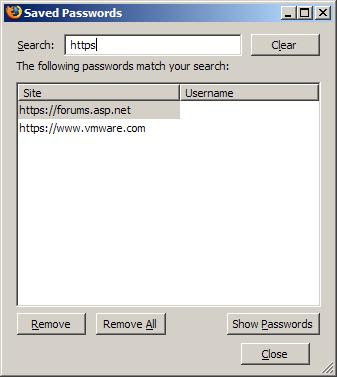 Click the "Saved Passwords..." button in the "Passwords" section of the "Security" tab. Find the offending site in the "Saved Passwords" dialog and click the "Remove" button. Click "Close" on the "Saved Passwords" dialog. Click "OK" on the Options dialog. Open the site again and Firefox should prompt you for the new credentials. I ran into this on a project I was working on where I needed to show a DataGridView for editing attributes. My attribute representation was a struct with a name property and value property... and when I bound a BindingList to the DataGridView, the list would appear... but when I'd edit the values would return to the old values... and when I'd add rows, the values would disappear. The explanation above explains why. It didn't dawn on me until I started Googling for "BindingList structs" and found Bill Wagner's "Of DataBinding and Value Types". The title tipped me off because I wasn't thinking about the fact that structs are value types. He also mentions in his article when it is appropriate to use structs. Thanks for a well-done article, Bill. So, reminder: use classes instead of structs when you need to do read/write binding. If you're merely databinding for a viewable list... use structs as you like. See the MSDN Documentation for more details and code examples. See the "ASP.NET Web Site Paths" article for more ways to discover paths. While debugging, I get the prompt for the source code file the PDB has signalled the debugger for (since it doesn't know where to find it initially...) and of course, since I don't have it, I click Cancel. When you click cancel at this prompt, it adds to a repository in the solution of files NOT to search for. This is annoying, because after that first prompt, you ask the team for the source code so you can go back, expecting the prompt again, and step into the potentially problematic code. 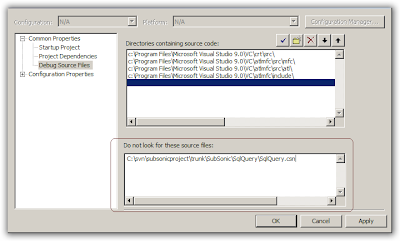 Well, Visual Studio supresses the prompt because of this list within the solution of files not to search for. Right-click your solution in Solution Explorer and go to Properties. Then click on the "Debug Source Files" section under Common Properties. Delete that sucker and Apply/OK out. I was debugging an app that was not handling a particular exception; and I found that after the Exception Assistant dialog appeared and I hit F5 to continue, that it would repeatedly recall the offending line of code which would again throw the exception. I searched the net and found this forum thread on MSDN that shed some light on how to allow the program to continue after the exception is thrown. 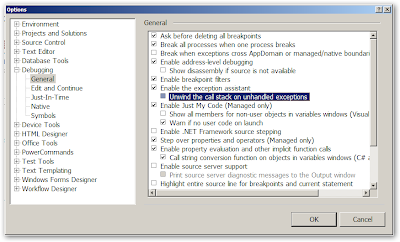 Uncheck the "Unwind the call stack on unhandled exceptions" to prevent the debugger from reverting to the offending line as the next statement to call. Microsoft emailed me today to warn me that Internet Explorer (IE) 8 will now be in "Standards Mode" by default instead of the "Compatibility" (sometimes referred to as "Quirks") mode the older versions have run in. This means that web developers that may have sites out there with invalid markup may run into some issues for people viewing their sites using IE 8. This is a GOOD thing Microsoft is doing, as it will make their browser play more like the others that are in "Standards" mode by default. The email Microsoft sent me is to inform developers that they're not left in the dark. Microsoft has offered a way to make the sites tell IE to go back into "Compatibility" mode so it will look the same as it would in IE 7 or earlier. NOTE: This is not an excuse not to fix your markup!!! You still need to fix your sites to be compliant with standards... this will just buy you some time until you do. Go to Microsoft's article to find out how to use this compatibility tag should you need to. "TF14087: Cannot undelete '[TFS FileName Here]' because not all of the deletion is being undeleted." Their disclaimer warns that it hasn't gone through their full testing process, so you're on your own with it... but we've had good luck with it so far using a solution that has over 150. For those of you that have to work in Solutions that have tons of projects in them in Visual Studio 2008; you've probably become quickly annoyed by the fact that when you open the solution, all of the projects are expanded. I got tired of it and searched around the net for something that would help... I found PowerCommands for Visual Studio 2008 by klevy. You can right-click anywhere in the Solution Explorer and select "Collapse Projects" from that level. I'm not going to profess to be the utlimate TDD guru; but I'm a firm believer and have been trying to continuosly better my skills in this development methodology. I started my TDD experience about three years ago using CSUnit; but whas quickly moved to NUnit when we found that CSUnit wasn't totally meeting our needs. I've been with NUnit ever since and have heavily used it over the past year in NUnit GUI, NCover and MSBuild. It's easy to use and gets the job done well. The Unit Runner is a little lacking in some areas (mostly aesthetics... but we're not going for prize winning eye-candy... we're testing our code...) but it's functional and easy-to-use. Scott Hanselman, entitled: 'MbUnit - Unit Testing on Crack'. How wonderful it looked to write one short test for multiple scenarios rather than multiple test methods with basically the same repeated code over and over again with different test data. So I took the simple phone number example I like to use when introducing someone to test-driven development and I made it my first experiment with MbUnit. Without going into TOO much detail, I basically will have my phone number scenario be where we're going to write a utility class with a static method on it that will take a phone number string (in this case USA phone numbers) and return a boolean specifying its validity as a USA phone number format. I make it a "red-green-refactor" scenario by first writing tests and implementing code that has pretty hard defined logic like string length tests, etc and then once I get some basic tests passing, I refactor the method's code to a regular expression and ensure the tests still pass. It's a fun little scenario and easy to help people pick up on the concept of Test-Driven Development. Anyway, I was very pleased with the Test Fixture and Test code and how nicely the Icarus test runner still views them as separate tests. How cool is that to have your test method take parameters so the same test code can be used for multiple scenarios? Booya! 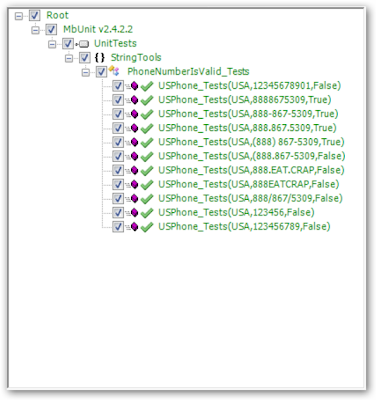 And you can see that I could easily add tests for non-USA phone number types by adding Row attributes that used a different value of the PhoneNumberType enum. Notice how it also shows the parameters being sent in to each test... makes it VERY easy to see what's going on with your tests. I love it! Oh yes, MbUnit is Test-Driven Development evolved. I'm very excited about the potential of this framework. Icarus Test Unit Runner is VERY alpha right now, but I'm excited at its potential. It's prettier than NUnit's GUI, though still showing its infancy. Icarus is very functional for being in alpha. Rumor is that ReSharper can also run MbUnit tests; so that will be awesome if that's true as well. So, if you're a test-driven developer and you're looking for some new hotness in test-driven technology... I'd highly recommend looking into MbUnit. To get hooked up with MbUnit and the Icarus test unit runner (and more) download the Gallio Automation Platform. Enjoy!